Here’s to impressionism in fly tying. Here’s to creating the illusion of mass without adding bulk. Here’s to using water as a key ingredient in a fly pattern. Here’s to tying flies that try harder to look like something that’s alive and good to eat than try to carbon copy the bait or insect. I often think of the discussions anglers have about herring or menhaden patterns. The chief complaint seems to be that a given pattern doesn’t mimic the deep belly profile of the bait. The next question that should be asked is, “Is that really necessary?” Anyone who has fished a large flatwing on the greased line swing to stripers feeding on herring knows the answer. If you talk to Ken Abrames, he’ll tell you about how an angler will come to him and complain that he’s not catching any fish. One of the first things Ken will do is ask to see the fly. If it’s up there on the opacity meter, Ken will start pulling bits of hair and flash out of the fly. Often, the angler then begins to hook up (ask me how I know). By all means, tie and fish the patterns you have confidence in. Just consider the sage advice of Bill McMillan, who doesn’t like to pretend that a fish is anything other than the primitive animal it is. I don’t see any big honking bellies or ultra-realistic 3D eyes on these flies. Funny thing! Stripers eat them like candy. Doesn’t look like the any of the grasshoppers I used to catch when I was a kid. Yet this fly is in grave danger any time I drift it past a grassy bank on a sunny summer day. For hundreds of years, the ultimate in sparse impressionism. And the fish haven’t gotten any smarter. In case you’ve never heard of Drew, he holds the current (and still growing) record for consecutive months catching a trout on a dry fly. I’m not sure where he’s at, but it’s well over 100. You do the math. I would also expect the Mahogany Duns to begin making an appearance. For those of us who love swinging wets, this can be a productive afternoon hatch. 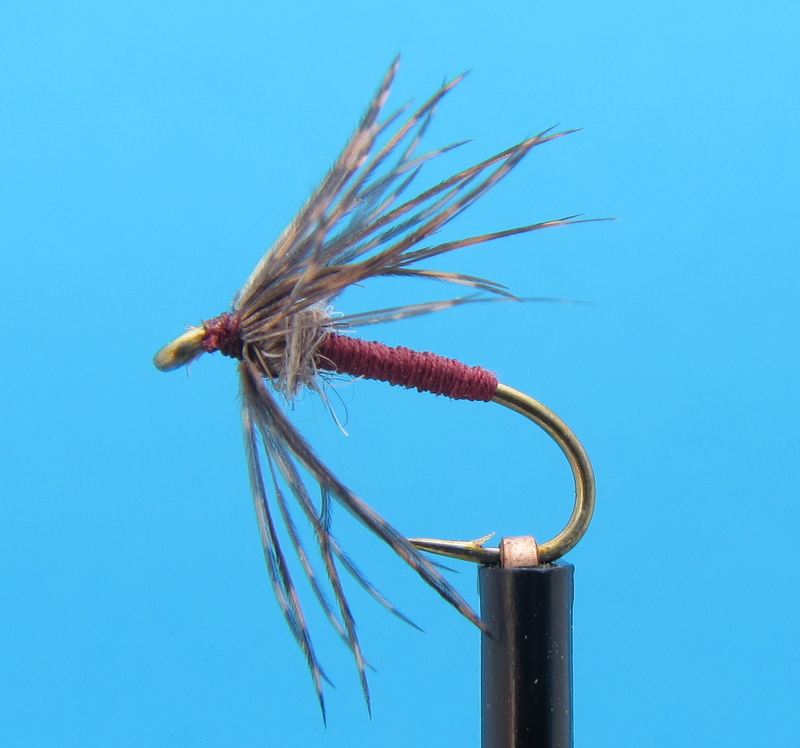 Try a February Red, size 16-18. The February Red. This is a size 12, so shrink it down for the paralepts.